Several Palestinian students choked on teargas on Monday morning during clashes with the Israeli occupation forces near al-Quds University, in Jerusalem’s eastern town of Abu Dis. 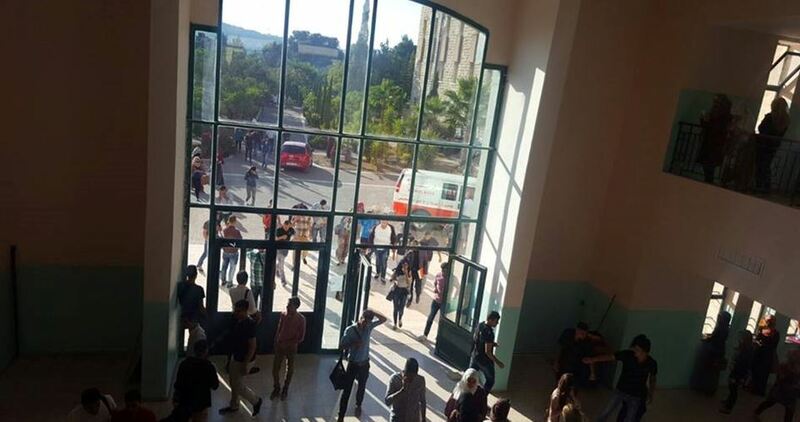 According to eyewitnesses, clashes burst out outside al-Quds University before they stretched out to the campus. The assault led to an abrupt suspension of the classes. Dozens of students have maintained vigil at the campus in anticipation of a projected escalation by the IOF. A number of students and protesters received field treatment for injuries sustained in the attack. A number of Palestinians were arrested and others injured at daybreak Monday after the Israeli occupation forces (IOF) stormed West Bank provinces and ravaged civilian homes. A PIC news correspondent quoted local sources as stating that the IOF stormed Jenin’s southern town of Yabad and kidnapped the sightless ex-prisoner Ezzedine Amarna and Ghaleb Atatra, also an ex-prisoner, from their family homes. Overnight, a flock of Israeli warplanes kept hovering over Qabatiya while a series of flying checkpoints was also pitched in the area. 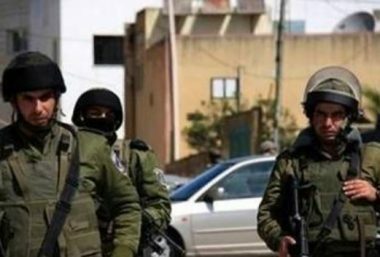 At the same time, the occupation forces dragged two Palestinian ex-prisoners to an unidentified destination after they broke into their family homes in al-Khalil province and attacked their relatives. Meanwhile, Palestinian youth Hassan Usfur was kidnapped by the Israeli soldiers from Senjel town, in Ramallah. 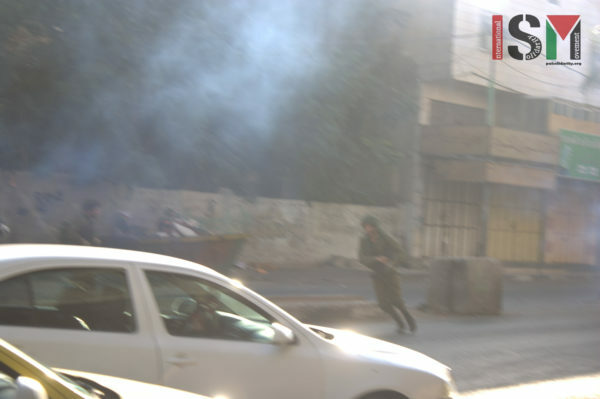 Violent clashes flared up in Nour Shams refugee camp, among other residential quarters in Tulkarem province, where the IOF attacked the Palestinian anti-occupation youth with randomly-discharged teargas canisters. The IOF further ordered the ex-prisoner Ahmed Abu Eisha to turn himself in to the Israeli intelligence at the soonest time possible. 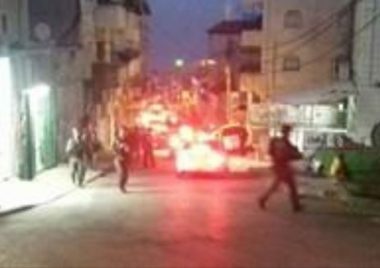 The sweep culminated in the abduction of a number of Palestinian young men from Silwan town, south of holy al-Aqsa Mosque, in Occupied Jerusalem. Israeli forces stormed the town of Abu Dis, in the occupied West Bank district of Jerusalem, on Sunday morning, and fired tear gas at university students and young schoolchildren at al-Quds University. Hani Halabiya, a spokesman of the Popular Resistance Committees in the town, told Ma’an News Agency that several university students, as well as schoolchildren that were also at the campus, suffered from tear gas inhalation as soldiers “haphazardly” showered the area with tear gas. An Israeli army spokesperson said that they were “looking into reports” of the raid. Al-Quds University, along with other Palestinian universities, has been subjected to numerous Israeli military raids in the past. Six al-Quds University students were shot and injured with rubber-coated steel bullets during clashes there, in April. The university was raided several times last year, when Israeli forces destroyed school’s property, injured scores of students during clashes, confiscated the school’s equipment and documents, and even staged a raid during a book fair for students in need, proceeding to destroy and confiscate all of the contents of the fair meant for struggling, low-income students. 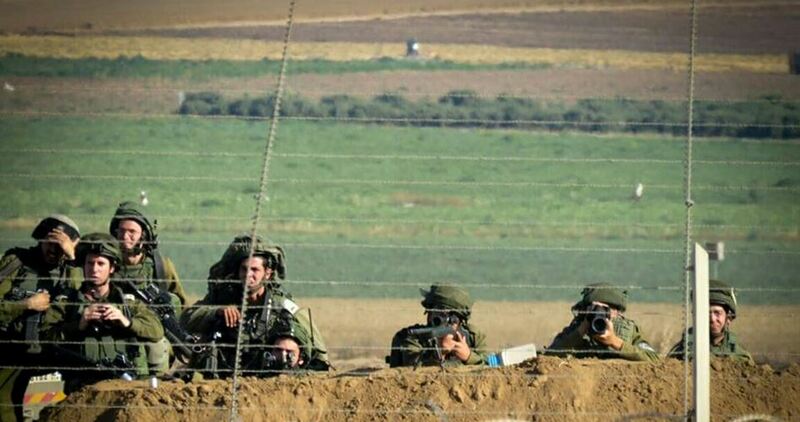 Israeli occupation forces (IOF) stationed behind the eastern border fence on Sunday evening opened fire at Palestinian farmers working in their lands located to the east of Khan Yunis in the southern Gaza Strip. A local source said that the IOF heavily opened fire at the farmers forcing them to leave their lands with no injuries reported. Limited incursions and shootings are carried out every now and then east of the Gaza Strip by the IOF in a flagrant violation of the ceasefire agreement that was concluded under Egyptian auspices after the 2014 Israeli war on Gaza. The Israeli occupation forces (IOF) on Friday night stormed Himsa hamlet in the northern Jordan Valley and assaulted the family of the girl child, Aseel Abu Aoun, who had been killed in a car-ramming attack by a Jewish settler over a week ago. Local sources told the Palestinian Information Center (PIC) that Israeli soldiers stormed the house of Tareq Abu Aoun, the slain child’s father, brutalized him and his family members, and threatened to arrest him if he did not remove the Palestinian flag from his rooftop. 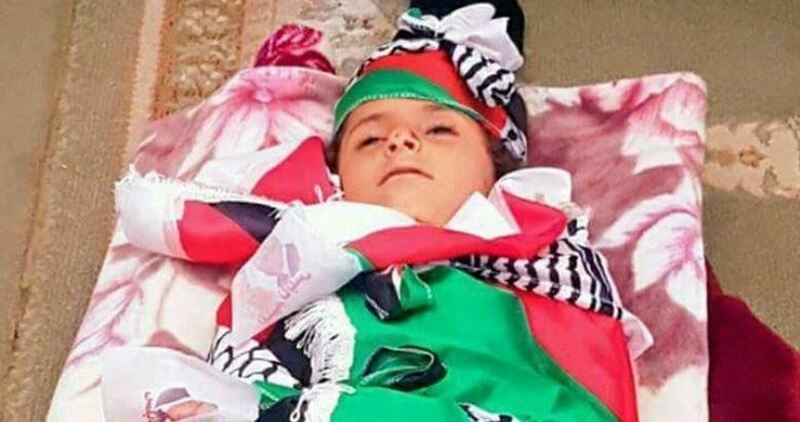 On August 26, a settler deliberately ran over eight-year-old Aseel on a road in the northern Jordan valley, causing her fatal wounds. She was pronounced dead in Rafidia hospital in Nablus. On Friday, 8th of September, large amounts of Israeli soldiers went into the H1 area of occupied Hebron, supposedly under full Palestinian control. The army used teargas and stun grenades at one of the main junctions in downtown Hebron, effecting the accessibility of the Manara sqaure area for Palestinian citizens. After Friday noon-prayer, the normal small scale protests took place by young Palestinians where ten soldiers came out of the H2 area monitoring the protesters in the street. Following this, the protesters backed away and discontinued their protesting. About fifteen minutes later, 40 soldiers invaded the area throwing sound grenades within the Old City and moving up into the main central hub of Hebron, in an area supposedly under full Palestinian control, in two military vehicles. Some rocks were thrown at the soldiers by a few Palestinian youth, which was immediately met with unreasonable force by soldiers throwing stun grenades and several tear gas canisters in an area with uninvolved civilians. Many Palestinians were forced to rapidly drive away in their cars in order to escape the suffocating effects of teargas used by the israeli forces in a civilian neighborhood. These included young children and families, and additionally many shop owners had to evacuate their shops due to the amount of tear gas clouds. The direction of the wind blew the tear gas back towards the soldiers who were throwing it, indicating that this disruption was not thoroughly planned, and many of the soldiers were not experienced enough to handle tear gas in the first place. Consequently, the soldiers were forced back past Shuhada checkpoint and into the H2-area under full Israeli military control. Tear gas, a so-called ‘non-lethal weapon’, causes effects of suffocation and untreated can lead to death. Many of its long terms effects are still unknown. Friday is a holy day in Islam, and many Palestinian citizens were enjoying their day off of work in the city-center. Most did not expect to have the city center disrupted by the Israeli forces, and others who work even on holidays, lost some of their daily income. The area which was invaded, is part of the H1-area, which according to the Hebron Protocol, is supposedly under full Palestinian control. This disruption was an extremely exaggerated response, in view of the fact that the small amount of protesters were not posing any kind of imminent threat. A Palestinian youth was injured in the chest by a rubber bullet as Israeli Occupation Forces (IOF) quelled the weekly march in Kafr Qaddum town in Qalqilya on Friday. 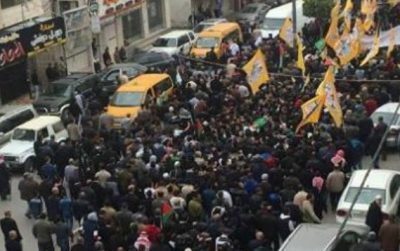 The anti-settlement peaceful march also demands the opening of the street which has been closed by the IOF for over 14 years. Coordinator of the popular resistance in the town, Murad Shteiwi, said that IOF soldiers showered the participants with rubber bullets as soon as the march kicked off. Shteiwi pointed out that the Israeli army has recently assigned a number of IOF soldiers to take pictures and videos of the participants in the anti-settlement marches via two small drones. Violent clashes burst out at daybreak Friday shortly after the Israeli occupation forces (IOF) stormed Bethlehem province, in the southern West Bank. 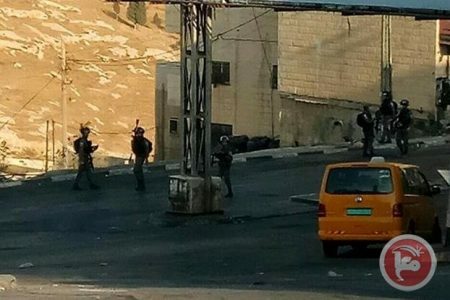 A PIC news correspondent quoted local sources as stating that the IOF handed over interrogation writs and attacked Palestinian protesters with randomly-unleashed spates of rubber bullets and teargas canisters. 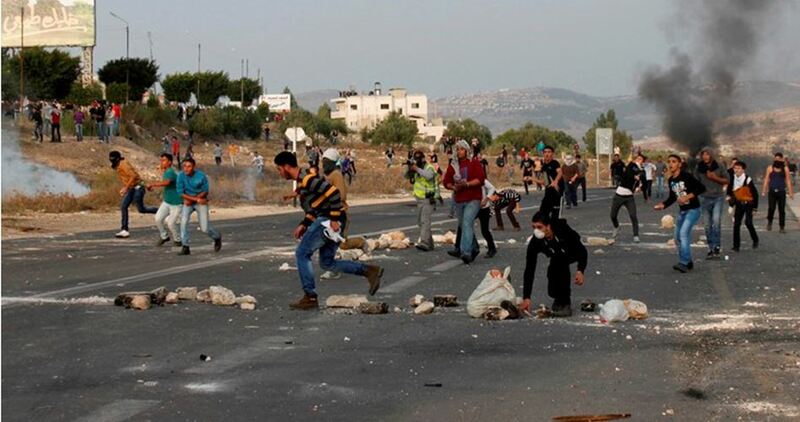 Palestinian anti-occupation youth responded by hurling stones and empty bottles at the heavily-armed occupation troops. The Israeli soldiers further showered civilian homes with teargas grenades, resulting in several suffocation cases and faints. Youngsters Muhy al-Deen Hameed and Mohamed Shweiki were summoned to questioning in the process. 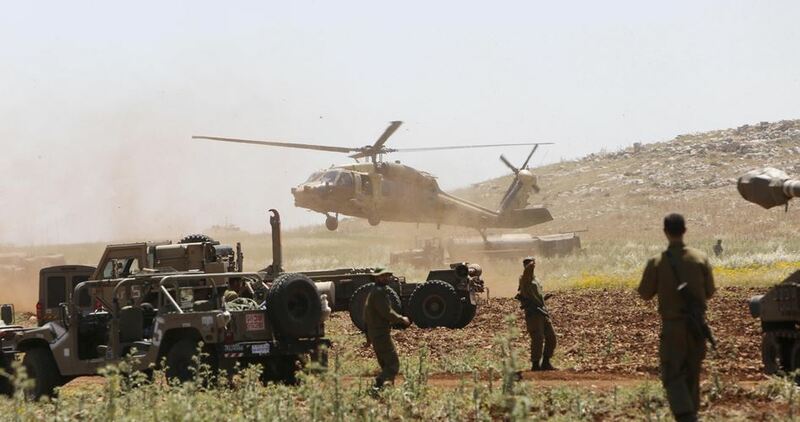 The Israeli occupation army has stepped up military drills in the northern Jordan Valley, inflicting heavy damage on Palestinian lands. Head of the Wadi Maleh Council, Aref Daraghma, said sounds of heavy blasts and live ammunition have been detected near civilian homes in the area overnight, sparking panic among women and children. He added that heavy damage has been wrought on the fauna and flora as a result of the unabated maneuvers. Daraghma also said that there are 12 military camps in the northern Jordan Valley and that the Israeli army closes off 38% of the area during military drillings and forces civilians out of their homes. Israeli Occupation Forces (IOF) stormed on Thursday Qabatya town near Jenin city. 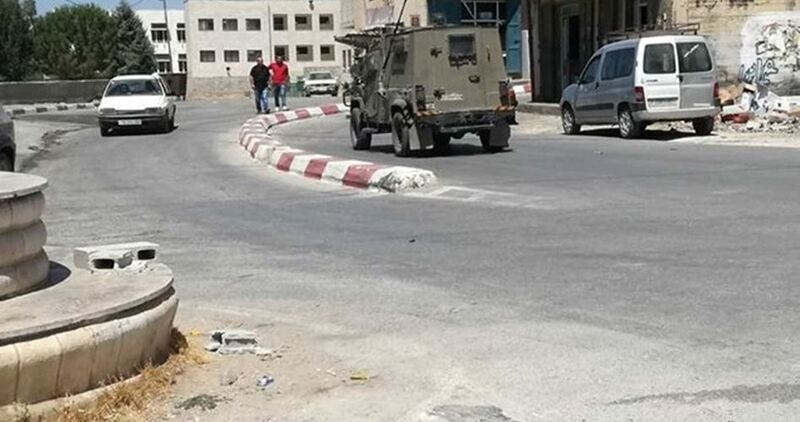 IOF soldiers were stationed at the entrance to the town and carried out field investigation against the inhabitants. The PIC reporter said that IOF troops were deployed in the vicinity of the home of Salah al-Saadeh which is located in the outskirts of the town. The soldiers erected a military barrier on the road then started searching the passing by vehicles and checking the IDs of passengers. The Israeli Occupation Forces (IOF) launched overnight and at dawn Thursday a large-scale raid and arrest campaign throughout West Bank and occupied Jerusalem. Clashes were reported during the raids. In Jenin, a number of local residents including women and children suffered breathing problems in Burqin town as clashes broke out when Israeli forces arrested a youngster. Local sources affirmed to the PIC reporter that IOF stormed the town in large numbers amid heavy fire of teargas bombs which led to the outbreak of violent clashes. A youngster was arrested from his house during the raid. In Tubas, another young man was detained and then taken to unknown location. Several neighboring houses were also stormed and searched in the city, while a military checkpoint was erected at a road linking between Tubas and Faraa refugee camp. Similar arrests were carried out in Nablus where violent clashes erupted in Asker refugee camp. A local youngster was detained from Balata refugee camp east of the city. Eight arrests were also reported in occupied Jerusalem including minors. Meanwhile, violent raids were carried out in al-Khalil and al-Bireh in West Bank. 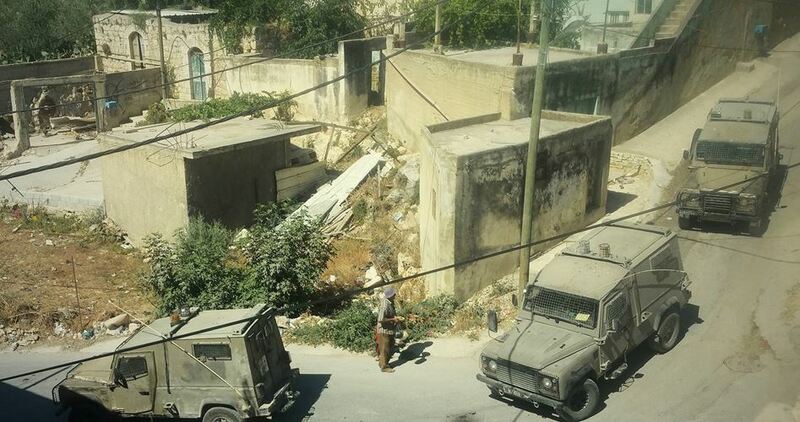 The Israeli Occupation Forces violently stormed Wednesday morning a Palestinian-owned home in Beit Ummar town north of the southern West Bank province of al-Khalil. The PIC field correspondent reported that Israeli forces stormed the area in large numbers accompanied with a number of military vehicles. During the raid, the soldiers broke into a local house belonging to Mohamed Zahaqiq after blowing up its door. Zahqiq’s two sons were severely beaten with rifle butts during that attack, the PIC reporter added. They both suffered different injuries. The soldiers also tried to arrest their brother Youssef Zahaqiq who earlier spent five years in Israeli jails. However, he was not at home during the raid. Israeli soldiers invaded, on Wednesday at dawn, the al-‘Eesawiyya town, at-Tour village, and Shu’fat refugee camp, in occupied East Jerusalem, searched and ransacked homes, and abducted five young Palestinian men. Mohammad Abu al-Hummus, a member of the Follow-Up Committee in al-‘Eesawiyya, said dozens of soldiers and security officers invaded homes and searched them. The soldiers also invaded Shu’fat refugee camp, clashed with dozens of youngsters, for several hours, and abducted Mohammad Abu Taleb, after breaking into his home and searching it. The soldiers also fired many gas bombs at homes and stores, causing several Palestinians to suffer the effects of teargas inhalation. In addition, the soldiers invaded homes in the at-Tour village, and abducted four Palestinians, identified as Abdullah Abu Ghannam, Emad Abu Ghannam, Kamal al-‘Alami and his brother Tareq. A Palestinian young man was shot and injured at the hands of Israeli policemen who arrested four Palestinian youths after clashes broke out Tuesday in Shufat refugee camp in Occupied Jerusalem. Three policemen were also injured in the even. Local sources said that the clashes broke out when Israeli police forces stormed the camp in the afternoon amid heavy firing of rubber bullets and stun and teargas bombs. According to the sources, three policemen were injured by stones and Molotov cocktails during the clashes. The Palestinian wounded man, however, was shot by a rubber bullet in the head and immediately taken to the hospital. The Israeli occupation forces (IOF) at dawn Tuesday carried out arrest campaigns in different West Bank areas, where they kidnapped several citizens from their homes, clashed with others and wounded a young man in his leg. No arrests were made during the IOF campaign in the town. 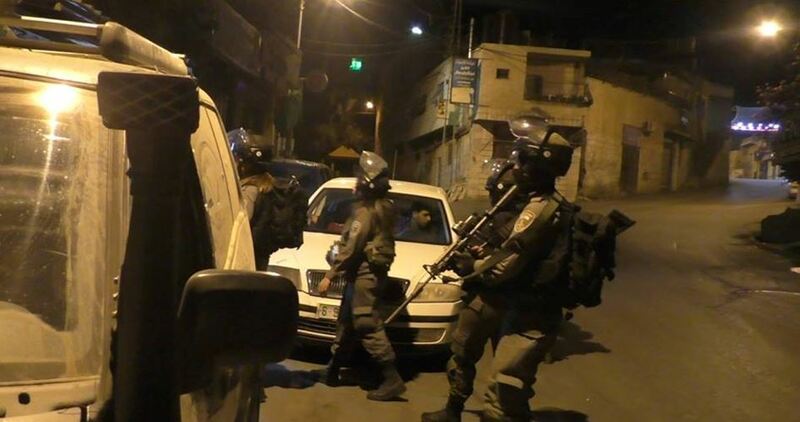 The IOF also stormed Askar refugee camp, east of Nablus, and kidnapped two young men from their homes. Local sources told the PIC that soldiers rounded up Mousa al-Mad’fa and Qusai Hashash after storming the camp. Four other young men were taken prisoners and one suffered a bullet injury during an IOF campaign in Far'a refugee camp, south of Tubas province. Eyewitnesses reported that Israeli soldiers clashed with local young men during their raids on homes in Far’a camp, adding that a young man called Mohamed Sawalmeh suffered a live bullet injury during the events. In Ramallah, violent skirmishes broke out at dawn between Palestinian young men and Israeli troops in the central district of Ramallah city. Locals said that the clashes happened mainly in the area of al-Manara junction and al-Ersal street, where the soldiers delivered notices warning store owners of selling toy guns, and pillaged and closed a printing press institution. The soldiers intensively fired tear gas and stun grenades at the young protesters in Ramallah, with no reported injuries. 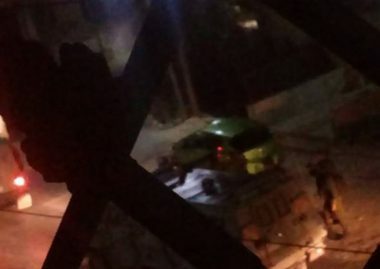 In Jenin, similar clashes took place in Jab’a town following IOF raids on homes. Two citizens identified as Ahmed Namer and Kamal al-Qaisi were kidnapped from their homes in Jab’a. Four young men, including two brothers, were also rounded up at IOF makeshift checkpoints on roads near the Jenin towns of Rummanah and Sir. In Qalqilya, Israeli soldiers reportedly assaulted citizens during violent dawn raids on homes in Azzun town, without making arrests. 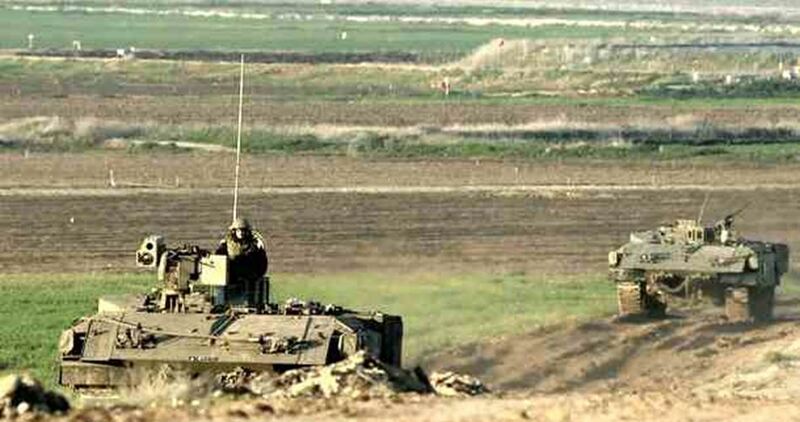 Israeli armored bulldozers on Tuesday morning infiltrated into a limited area to the east of Gaza City and started to level tracts of land, under military protection. According to eyewitnesses, four bulldozers advanced into an agricultural area east of al-Shuja’iyya neighborhood and embarked on razing plots of land, while other military vehicles and tanks were seen providing them with protection from a distance. Gazan farmers incur heavy losses as a result of Israel’s repeated military incursions into their agricultural lands, which are located along the besieged enclave’s borderline with the 1948 occupied territories. Israeli soldiers invaded, on Monday at dawn, Beit Rima town, northwest of the central West Bank city of Ramallah, wounded one Palestinian with live fire, and abducted another. 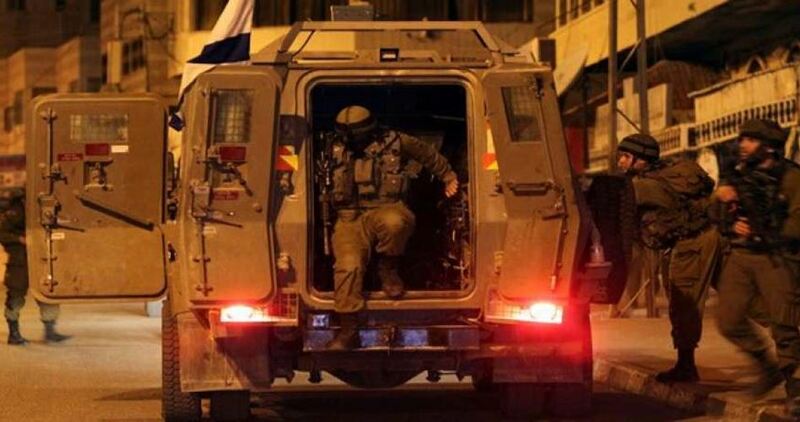 On Sunday at night, undercover Israeli soldiers abducted one Palestinian near Hebron. 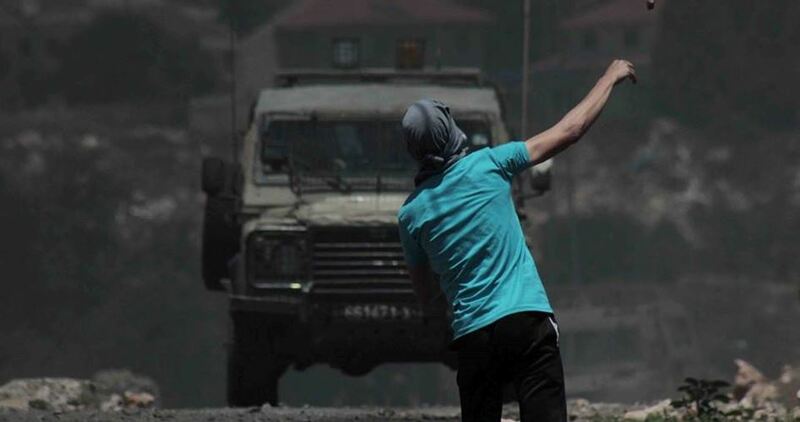 Media sources in Ramallah said several army jeeps invaded Beit Rima town at dawn, and clashed with many youngsters, who hurled stones at the military vehicles. The sources added that the soldiers shot a young man with a live round in one of his knees, before local medics rushed him to a hospital in Ramallah. The soldiers also abducted another man, identified as William Rimawi, 30, after invading his home and violently searching it, causing damage. 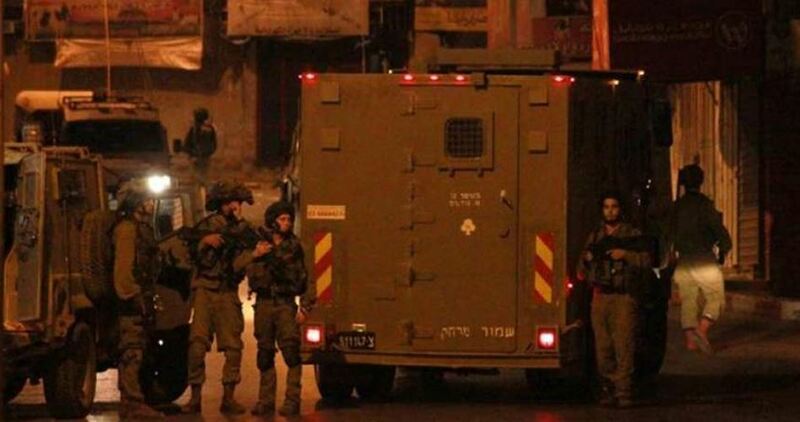 On Sunday at night, undercover Israeli soldiers infiltrated into Yatta town, south of Hebron, abducted a young man, identified as Sami Hafeth al-Hreini, 22, and took him to an unknown destination. The soldiers also fired live rounds at a Palestinian car in Khallet al-Mayya area, close to settlement road #60, south of Hebron city, and initiated extensive searches. 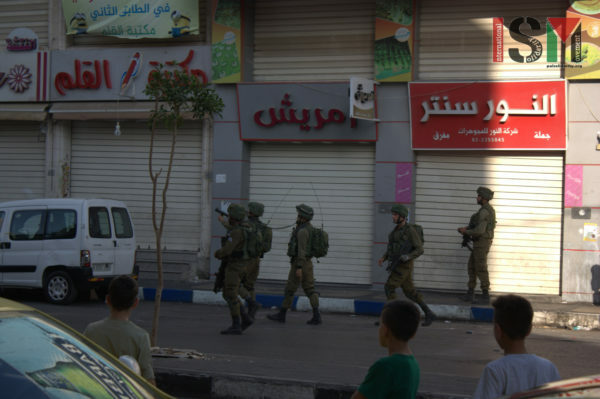 Israeli soldiers assaulted, Sunday, dozens of Palestinians marching nonviolently against the Annexation Wall and colonies, in the center of Hebron city, in the southern part of the occupied West Bank, and abducted a local volunteer with the Israeli Information Center for Human Rights in the Occupied Territories (B’Tselem). The residents were marching against the Israeli decision to isolate the Old City from its surrounding areas, and the illegal Israeli apartheid polices against the indigenous Palestinian inhabitants. The new Israeli policies provide increased power for the illegal Israeli settlers to act with impunity against Palestinians. As they marched, they chanted and called for the removal of the Annexation Wall, the removal of all Israeli colonies, including the removal of the illegal settlers occupying Abu Rajab family home, in the Old City. They called for a life with dignity, free from occupation, colonization and oppression, and for resistance to Israel’s illegal policies of segregation and apartheid, especially the recent Israeli decision signed by the Head of the Central Command, Major General Roni Numa, establishing a municipal services administration for the Jewish settlers in Hebron. The procession was organized by the Youth Coalition Against Settlements, the International Committee Against Racism and Apartheid, in addition to the Salayma and Gheith families. The demanded an end to the illegal Israeli occupation of Palestine, the preservation of the Palestinian identity of Hebron city, freedom of movement and basic rights of dignity and liberty as stated by International Law. The soldiers resorted to excessive force against the nonviolent protesters, and abducted Ra’ed Abu Mayyala, 35, who is also a volunteer with the Israeli Information Center for Human Rights in the Occupied Territories (B’Tselem). This could mean the removal of native Palestinians, and the illegal confiscation and annexation of their property. Amro added that preparations are underway for an international campaign titled “Hebron is a Palestinian City and not for Settlers,” aiming at ending the apartheid and segregation polices in the city, and reopening all closed Palestinian roads and homes, by removing the illegal colonists from the heart of the city. Responding to the decision, the Israeli Peace Now Movement said, “By granting an official status to the Hebron settlers, the Israeli government is formalizing the apartheid system in the city. This step, which happened immediately following the announcement of the evacuation of the settlers who took over a house in Hebron, is another illustration of the policy of compensating the most extreme settlers for their illegal actions. Undercover Israeli soldiers abducted, on Sunday evening, a young Palestinian man from Yatta town, south of the southern West Bank city of Hebron, after firing live rounds at his car. Rateb Jabour, the media coordinator of the Popular Committee against the Wall and Colonies in Hebron, said undercover Israeli soldiers abducted Sami Hafeth al-Hreini, 22, in Khallet al-Mayya area, close to settlement road #60, in Yatta. He added that the soldiers also opened fire at a Palestinian car in the same area, and initiated extensive searches. It remained unknown why the soldiers opened fire at the car.